The Staffordshire Bull Terrier is an interesting breed of dog. It is a medium size bull terrier. It is usually a very friendly dog to family and friends. The Staffordshire is a dog that loves to be with its family. When it is apart from its family, it can start to act out so one should be sure to spend plenty of time with it. The Staffordshire usually only has difficulty with other dogs. As a general rule of thumb, it is good to put two dogs together to see if they can get along before bringing both of them home and this is especially true with any Staffordshire. Another important piece of information about the Staffordshire is that it is very good with children. Where the dog comes from, Staffordshire, England, it is often referred to as the “Nanny Dog” because of its loving and protective nature towards children. Does this mean that one should fire their nanny and get one of these dogs? Obviously not, but if one is looking for a dog that is going to protect their child and be a friend, then this is a dog to consider. Another thing to consider about the Staffordshire is that they need quite a lot of exercise. It is a good idea to take this dog for a walk at least once per day or let them out in the yard and play with them. When an animal does not get enough exercise each day, they start to get into trouble and this is when the Staffordshire, or any dog, will start tearing things up in the house and generally making a mess. Therefore, having a fenced in yard and being able to play with the dog everyday is generally a good idea. Also, if one is looking for a dog to go running with, this is an excellent choice. As far as its coat is concerned, not much care is needed. Because it has short hair, it does not need an extensive amount of brushing or specialized care. A bath once in a while with brushing afterwards is about all this dog would need. If any health or coat conditions arise, a veterinarian should be consulted. The Staffordshire Bull Terrier is not commonly afflicted with any specialized health problems. It has an average life span of about twelve to fourteen years. The only commonly seen health problem is CHD or Canine Hip Dysplasia. This is not a crippling disorder but it is one that should be treated and watched after. Another disorder that has been seen in this breed is cataracts. Again, this is not a life threatening disorder but it should be watched after. Common tests that are recommended for this breed are eye and hip tests. Other than eye and hip problems, there are no other specialized tests required for the Staffordshire. Regular tests and scheduled appointments should still be made to maintain the dog's health and well being. The history of the Staffordshire Bull Terrier is as interesting as it is uplifting. It came from a sad beginning: dog fighting. In urban England, before dog fighting was made illegal, contestants sought a dog that was nimble, fast and had strong jaws. This led to the cross breeding between bulldogs and terriers. Another concern at the time was having a dog that was easily handled by its human owners but at the same time ready and able to fight in a ring. 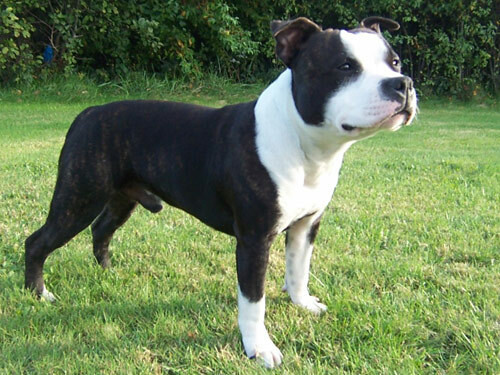 The selective breeding in Staffordshire led to the bull terrier that is present to this day. Because the dog was so well received by owners, even after dog fighting was made illegal in England the Staffordshire was sought as a pet. In 1935, the England Kennel Club granted the breed membership and in 1974, the American Kennel Club granted the Staffordshire entrance. Today, the Staffordshire Bull Terrier enjoys a place in its owner's heart and it is truly a pleasant breed to behold.